Looking for your dream home in Jerusalem? Leading Israeli housing company holding fairs in Brooklyn, Monsey and LA. This week, Chish Nofei Yisrael, Ltd. will sponsor a 3-day housing fair in the USA in three convenient locations in Brooklyn, Monsey and Los Angeles. Chish Nofei Yisrael, the leading Israeli housing and development company to represent the frum public, has gained worldwide repute for its personal, courteous and reliable service. The upcoming fair, which offers homes for sale in some of the most popular new developments in the greater Jerusalem area, follows similar fairs that met with extreme success among the religious community and resulted in the sale of over 50 housing units within three days. Available projects for sale include the exclusive Mishkenot Ha’Uma on Sarei Yisrael Street; Top 80 in Neve Yaakov; Givat Zev; and Chish Nofei Yisrael’s flagship project, Ramat Givat Zev, the first-ever neighborhood in Israel developed specifically to meet the needs of an American Torah-based community. 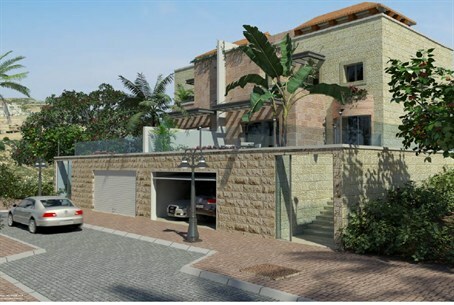 The majority of homes in Ramat Givat Zev have been purchased by American olim who aspire to combine the best of both worlds. The beautiful neighborhood in pastoral Ramat Givat Zev emphasizes spiritual quality coupled with the warmth and friendliness of an English-speaking community and reflects the values, needs and mentality of frum olim acclimating to a new life and country. Housing units in the development include private villas, as well as attractively-designed, spacious apartments that allow frum families to make the move to Israel without compromising on their standards. Special sales and offers will be available at the 3-day fair. A brand-new development geared specifically for frum American Jews is inspiring dozens of families to commence the process of aliyah with the goal of making Israel their one and only home. The beautiful future neighborhood in pastoral Ramat Givat Zev is already being lauded for its emphasis on spiritual quality coupled with the warmth and friendliness of an English-speaking community that reflects the values, needs and mentality of frum olim. Located on the outskirts of mountainous Jerusalem, only fifteen miles from the city center, Ramat Givat Zev is the ideal solution for American olim. The development is designed for 400 housing units, including 140 houses and 260 spacious apartments. Answering the immediate needs of Torah families, a Vaad Rabbanim was formed to arrange for all chinuch needs in Ramat Givat Zev. Mosdos chinuch, already in the planning stages, will be specifically geared to fit the spiritual and academic aspirations and goals of Americans living in Israel and will offer special programs to help new immigrant students acclimate to the vast changes in their lives. The schools, set to be built on beautiful, spacious campuses, will boast sports fields and other amenities favored by American students. A second committee was likewise established to guarantee that the needs and desires of frum olim are met. From the primary planning stages, the developers focused on ensuring that the neighborhood would encompasses all possible elements, ranging from the spiritual necessities of shuls and schools to the conveniences and luxuries of shopping centers and a swimming pool. Developer Chanoch Kass proudly asserts, “Ramat Givat Zev is outstanding in the fact that it will be the very first neighborhood in Israel specifically developed for an American Torah community. Ramat Givat Zev’s list of buyers includes frum families from Monsey, Flatbush, Five Towns, and Miami who are excitedly preparing for imminent aliyah. Many houses were also purchased by American families currently residing in the Ramat Beit Shemesh area. One buyer, Dovid Weinstein, explains that, for him, a main motive in moving is the fact that his current neighborhood lacks what he feels are fundamental elements for Americans living in Israel. Although hundreds of Americans have settled in Ramat Beit Shemesh in the past two decades, the neighborhood was initially planned and constructed for an Israeli public, a fact that understandably presents many a hardship and challenge to American olim, young and old. The concept of Ramat Givat Zev was inspired by a partnership between a party of Americans living both in Israel and the USA and a group of sympathetic developers in Israel who joined forces to answer the cry of Americans who aspire to make aliyah, but are daunted by the seemingly insurmountable challenges entailed. Together, they determined to overcome these obstacles by providing these families with all they lacked. Thus began the lengthy process of slating plots for spacious villas with assorted construction and design options, inviting esteemed Rabbanim to spearhead the kehilla, and engaging respected mosdos chinuch and administrators who understand the American mentality to establish roots in the neighborhood. Ramat Givat Zev is being marketed by Chish Nofei Yisrael, a construction and development company in Israel that has already sold thousands of housing units in Israel and is regarded as the leading development company in the country dealing with the chareidi-National Religious public. The company is on the brink of concluding the sale of 1000 residential units in Givat Zev, with Ramat Givat Zev designated as its flagship project due to its unique status as the first-ever neighborhood in Israel specifically formed for a frum American community.